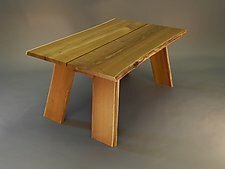 "Steeped in the design philosophy of the studio furniture movement, I strive to use traditional techniques of quality furniture construction and develop new designs that are fresh and innovative." Inspired by the honesty of the arts and crafts movement and the 1970s British crafts revival, Tim Wells continues to use traditional techniques of high quality construction with a contemporary twist on design, blending simplicity of form with function. 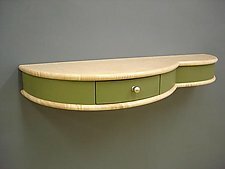 Tim Wells approaches his work in a unique way, by drawing on British joinery techniques and using honest materials to create new designs. One way that he accomplishes this is by wrapping forms with leather. He uses renewable resources, including locally grown hardwoods, and his attention to detail and quality construction are precise. Tim Wells completed a traditional five-year apprenticeship in the UK with John Makepeace. 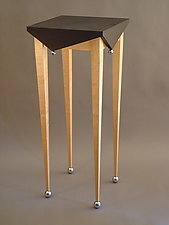 During that time he earned the Craft Certificate in Furniture from the City and Guilds of London Institute, with distinction in handmade furniture construction. After two years of perfecting his craft as a journeyman with Wendell Castle, Tim established himself as a master craftsman in the United States.